For technical papers, click here. The concept of Digital Twins has been presented by many companies recently. However, it can mean different things for different people. The definition of interest for people with an interest in Structural Health Monitoring (SHM), is that a Digital Twin is a simulation model that represents the true physical product to a sufficient extent, considering its purpose, during the entire service life of the product. In this context, test data is used to validate and update a simulation model so that structural responses can be predicted with confidence, even at locations that will not be instrumented. The simulation makes use of real-world loading and supports, also obtained from testing. Depending on the monitored structure, a simulation model can be created with mature traditional codes (like Ansys, Abaqus, Nastran,...) that have the advantage of being well known, robust, and used by many companies worldwide. Data interfaces and driver add-ons are available in software like FEMtools. Alternatively, specialist simulation codes may be available that are better suited for specific purposes, for example for modelling and simulation of oil&gas offshore platforms. The advantage of such specialist codes is that they are well adapted to the simulation and decision-making tasks at hand (e.g. material models, joints, nonlinearity, wave and wind load models, fatigue analysis according to industry standards,...). For this purposes, the scripting capability in FEMtools facilitates the development of customer interfaces and drivers. The Digital Twin is created by reducing uncertainty on the input parameters (geometry, materials, joints, loading,...) based on validation test data (see FEMtools Model Updating). Such testing may be based on sensor data like accelerometers for operational modal analysis, strain gauges at selected locations, displacement transducers (e.g. GPS receivers) complemented by measurements of environmental conditions (e.g. wind, temperature, wave height). In such Digital Twin, the stress at any location of the platform can be obtained, even if there is no strain gauge in that location, and this at any moment in time (if the deformation measurement data is stored 24/7). This technology was demonstrated by DDS on projects like Hong Kong Stonecutters bridge and Oil platforms in North Sea [1-2]. There are other researchers who have demonstrated and confirmed the validity of similar techniques to estimate the peak stresses at locations where there is no possibility for direct strain measurements, like for example at a wind turbine tower base and foundation. Once peak stresses are known, and loading (past and future) can be estimated, then fatigue analysis is used to estimate residual life expectancy. Less uncertainty on stress evaluations means that lower safety factors can be used to demonstrate that the residual lifetime is sufficient. For example if an uncertain (non-validated) simulation model is used and a safety factor of 5 is needed, then 100 years lifetime must be demonstrated with the model if the requested remaining lifetime is 20 years. With a more reliable Digital Twin (validated and updated model), the safety factor may be reduced to 3 and only 60 years residual lifetime must be demonstrated. This may result is less critical spots to inspect or reinforce and thus saving time and money. This way, aging structures that may otherwise have to be decommissioned can be kept in operation for a longer time while respecting the safety standards. Bottom line: the combination of a validated simulation model and load data from testing, results in a complete Digital Twin that can be used to compute peak stresses at joints, welds or other critical locations even if these are not directly instrumented. From there, it is possible to estimate residual life, decide on the need for reinforcements and better plan on-site inspections. FEMtools is the perfect tool for developing Digital Twins, thanks to its interfaces with FE and test data, its unique blend of database and analysis tools, framework architecture and scripting capabilities. E. Dascotte, Vibration Monitoring of the Hong Kong Stonecutters Bridge. Presented at the 4th International Conference on Experimental Vibration Analysis for Civil Engineering Structures (EVACES 2011), October 3-5, Varenna, Italy. Digital Twin model of Hong Kong Stonecutters Bridge and an aerial photograph shown side-by-side. The Digital Twin shows realtime deformation of the bridge and stress build-up using input from GPS receivers at tower tops and on the bridge deck. 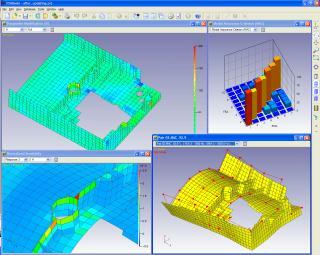 A major challenge in FE model updating is to decide about which updating parameters to use. In those cases that the updating parameters are well identified, for example because they have not been validated before or simply because there is much uncertainty about their value, then model updating is mainly a matter of running the automated procedure to iteratively update the selected parameter values. Depending on the sensitivity values, the choice of starting values, and number of selected parameters, there can still be difficulties to obtain satisfactory correlation with test results. However, many diagnostics and settings are available in FEMtools Model Updating to overcome these difficulties. Many times updating parameters cannot be well identified, and then exploratory model updating can help. This involves selecting parameters at the element level ("local parameters") and updating them as independent parameters. With many local parameters selected, updating results are presented as a color-coded plot that highlights the areas of the model that need large modifications. This may provide insight about the type of modification that is needed in the model. Parameters like elastic modulus, mass density or plate thickness are very useful parameters for this purpose. In the case of exploratory model updating they must be interpreted as indicators for mass and stiffness changes that may relate to physical element properties (like material properties or joint stiffness) or can be used to pinpoint issues with mesh density or lack of detail in the model. In this latter case, upgrading the model or refining the mesh may be a necessary first step before returning to updating of physical element properties. Eventhough exploratory model updating does not entirely solves the issue of parameter selection, it is a very powerful tool to assist in decision making. It helps to filter out parameters that do not matter, and focus on areas and parameters that are most likely to be in need of updating. Sensitivity analysis can also be used for this purpose but requires that the sensitivity pattern for each response is examined and compared. This can be unpractical in case there are many parameters and responses to examine. Model updating will condense the results in a single plot per parameter type. For example, the figure below shows the local updating of elastic modulus in an engine block, needed to match the first 10 modes shapes with test results. This may be due to a local stiffness issue or could be related to the choice of mesh density in this area. Further investigation is required to decide about how to interpret this result and what to do next. Exploratory model updating is a unique capability of FEMtools Model Updating. It includes the tools to automatically generate and handle local updating parameters, and the possibility to efficiently compute a potentially very large number of sensitivity coefficients. The parameter estimator that is used for iterative model updating is a special-purpose gradient-based optimizer that is able to handle the big sensitivity matrix and large number of parameters. There is no more practical reason to not consider exploratory model updating for preliminary investigation and learning about the model at hand. Exploratory model updating of an engine block model to match 10 mode shapes. The areas colored in red requires further investigation. Researchers at Technical University Vienna (Austria) and University of Bologna (Italy) have used FEMtools MPE to process massive amounts of vibration data collected with modern full field measurement technologies. In the framework of the EU-sponsored TEFFMA project (Towards Experimental Full Field Modal Analysis, FP7-PEOPLE-2011-IEF-298543), a comparison is made by means of challenging optical technologies (SLDV, Hi-Speed DIC, Dynamic ESPI) on the same broad band vibration measurement problem of a lightweight plate, with different spatial resolution and quality of the measured patterns. For each measurement, an experimental modal model is extracted and finite element model updating results are compared between different full field technologies. The results expected from this research will strengthen the path of full field technologies in mechanical engineering and other fields, ranging from aerospace to vehicle technologies, electronic components, and advanced material behaviour analysis. The following figure shows an example of such high-resolution mode shape. Full field measurements were taken at 49042 points resulting in FRFs at 1285 frequency lines and occupying several GB of disk space per experiment. All FRFs of an experiment could be imported in FEMtools and efficiently processed by the Modal Parameter Extractor (MPE) add-on for extraction of mode shapes. Plate mode shape at around 246 Hz obtained using FEMtools MPE, from FRFs measured by ESPI using a 226x217 measurement grid. Damage has a direct impact on the modal parameters of structures. However, finding the location and severity of the damage from the modal parameters is a challenging task. This is because damage identification problems are in general highly undetermined, i.e. the number of potential damage locations is much higher than the size of the experimental data set. In a paper written by DDS engineers , the concept of a damage scenario-based framework was presented that tries to overcome this problem by both increasing the size of the experimental data set and reducing the number of investigated damage locations. Using a carefully validated FE model of the undamaged structure, the effects of a number of damage scenarios are simulated. Eventually, the identification routine detects the fingerprints of the damage scenarios in the frequency pattern of the damaged structure. The scenario-based damage identification framework has been evaluated and showed promising results. It appears to be possible to decompose the measured frequency pattern into the signatures of a series of pre-defined damage scenarios. The scenario-based approach seems to be capable of not only identifying the location of the damage but also the degree of damage. It is a realistic assumption that only a limited number of damage scenarios with high probability can be expected most mechanical and civil structures. This situation can be enforced by introducing weak spots in a built structure and monitoring damage on these spots only, thus introducing manufactured damage scenarios. In a follow-on paper by a Hansen et al , the same concept was further investigated with a focus on the practical considerations which are crucial to the applicability of a given vibration-based damage assessment configuration. The technique is demonstrated on a laboratory test case using automated OMA. to simulate the practical situation of ice accretion on wind turbine blades. Ice accretion on the rotor blades of a wind turbine leads, among other things, to added loads, safety issues and diminished aerodynamic performance of the airfoil. This type of perturbation constitute an added mass and occurs frequently in northern regions. The presented technique could be implemented directly to localize and quantify ice accretion. J.B Hansen, R. Brincker, M. Lopez- Aenlle, C.F. Overgaard, K. Kloborg, A New Scenario-based Approach to Damage Detection using Operational Modal Parameter Estimates. Mechanical Systems and Signal Processing 94 (2017) 359-373. For the purpose of finite element model validation, any test data that is reliable and relevant can be used. Some people give preference to using raw, unprocessed test data. In the field of structural dynamics, it can be discussed if it is better to use FRFs (Frequency Response Functions defined as response spectra divided by input force spectra) or the mode shapes that can be extracted from these FRFs. Mode shapes are a powerful mathematical tool to represent the dynamics of a structure. Although limited to linear behavior and best used with lightly, proportionally damped structures, they allow a condensation of the often massive amount of FRF data. Working with a condensed set of data is more practical for FE-Test correlation and helpful to gain understanding of the gap between FE simulation and the true structural behaviour through the examination of modes shapes and resonant frequencies. For solving the FE model updating problem, requiring to minimize an objective function that describes the distance between FE and test, it is common to use a gradient-based optimization approach. The definition of the updating problem in terms of response residues (differences between comparable FE and test structural responses), computation of the gradients, and optimized parameter estimation all benefit from using the relatively compact set of modal data compared to the FRFs. The benefit comes from the ease of use and data handling, and computation speed. The use of FRFs would be mandatory in case target modal parameters are not available or cannot extracted from the FRFs with confidence. For example, when the structure exhibits high non-proportional damping, high modal density, or nonlinear behaviour. Another benefit of FRFs is that amplitude levels are sensitive to damping. In the modal approach, the extracted modal damping, which is known to be highly unreliable, can only be used as input for the FE analysis. From FE computional point, modal superposition is still the industry standard tool for simulating FRFs. One can therefore state that if analytical mode shapes are used for simulating the FRFs, then these are the raw data and should be used for validating the FE model. On the other hand, test FRFs represent the true response of a structure under given test conditions, and therefore they reflect the true non-linear nature and real physical damping of a structure. If it is the objective of validating and updating an FE model to incorporate those properties in the model, then one cannot do with mode shapes. Vice versa, if the FE model is intended to be a linear and simplified representation of the real world behavior, then using FRF-based updating may result in residual discrepancies between the simulation and test FRFs that cannot be overcome by updating, due to missing refinement and necessary physical parameters in the FE model. In summary, when extraction of modal parameters from FRFs is not recommended, when analytical FRFs are computed using a direct method, or when the updating parameters include damping, then FRF-based updating should be seriously considered. In all other cases, the modal approach is preferred. If only experimental FRFs are supplied, then the FEMtools MPE tool can be used for modal parameter extraction. An example of FRF-based (left) and modal-based correlation and model updating using FEMtools Model Updating. Testing and simulation are traditionally done by separate teams. Test engineers will hand test results over to FE analysts who use them for the FE model validation and updating process. Test data has an important role in the validation process and serves as the reference, representing the true physical behaviour of the structure during the specifically designed validation test. Considering the important role of test data in the validation process, it is mandatory to adopt the highest standards with respect to equipment, operator training, data processing and reporting. The quality of the test result must be guaranteed in order to make subsequent use of it for decision making during model validation and updating. Double checking of the test data by an independent expert may be required as part of a quality assurance standard. In case validation testing is based on experimental modal analysis, the FE analysts working on model validation will usually be provided with only the modal parameters (resonant frequencies, mode shapes, modal damping). The data must be accompanied by a detailed report on the test conditions and processing that was done. However, it is recommended to also provide the analysts with the raw test data and the software tools to double-check modal extraction done by the test team. This provides them an opportunity to gain additional insight in the response of the structure under test and for making informed decisions during the updating process. Modal analysis of a satellite structure using the global MPE applet. The FEMtools Modal Parameter Extractor (MPE) add-on tool is a high performance tool that can be used by FE analysts with only minimal training to obtain modal parameters from Frequency Response Functions or output-only time histories. The polyreference method that is used produces very clean stabilization charts and reduces the often subjective separation between physical and mathematical poles. Complemented by validation tools and a local curvefit method for data that is affected by mass loading, this add-on tool provides a fast and easy way to increase confidence in the modal parameters by double-checking. In case different results are obtained, the FE analyst has good reasons to inquire with the test team and demand their confirmation of results. Safe operation, availability and lifetime assessment of piping are of utmost concern for plant operators. The knowledge on how failures in piping and its support construction are reflected in changes of the dynamic behavior is a useful basis for system identification and Structural Health Monitoring (SHM). Modal analysis of complex piping, the identification of system changes and the use of vibration dampers in piping still constitute challenges. Researchers at the MPA University of Stuttgart in Germany used Operational Modal Analysis (OMA), finite element modelling and model updating to study changes in the natural frequencies and corresponding mode shapes due to through-wall cracks or changing boundary conditions. One part of their study involved the design of a new type of tuned mass damper (TMD) that was first tested in the laboratory of MPA. Using detailed FE modelling, updated by OMA, provided the information necessary to adapt these TMD for efficiently cancelling the resonances in a piping system of a chemical plant. In another part of their research, the influence of local wall thinning on the eigenfrequencies and mode shapes of a laboratory piping system was evaluated. Using sensitivity analysis and FE model updating it was found that rotational spring stiffness of the supports were important parameters for successful model updating. FEMtools was also used to sort a large number of local mode shapes which led towards the detection of a high order mode that showed a collapse-like motion at the exact position of the local wall thinning. Comparison of the higher order mode shape of two FE models, without (left) and with (right) local wall thinning in the elbow. Eventhough the change in eigenfrequency was very small, an 8% change in Modal Assurance Criterion (MAC) was observed, which was significantly higher than all other mode shapes. The correlation between FE analysis and modal testing for this particular mode shape was demonstrated to be most sensitive for local wall thinning at the elbow, compared to other (lower order) mode shapes. This finding suggests that it might be possible to design a structural health monitoring device that is capable to detect mode shape changes such as this, for example by using a laser doppler vibrometer and automated scanning robots which make it possible to get experimental modal data at a resolution close to that of the FE-model. Used on a regular basis in an operational plant, such device can be a cost-efficient tool to prevent structural failure. Multi-Model Updating (MMU) is simultaneous updating of multiple finite models that each correspond with a different structural configuration, but that share common updating parameters. If for each configuration modal test data is available, then MMU is used to combine the sensitivity information from every configuration and in this way increase the number of updating targets. This will lead to an improved condition for model updating compared to using only a single test. For example, solar panels for satellites can be tested during different stages of deployment. A finite element model and modal test data can be obtained that correspond with each stage of deployment. This provides a richer set of test data to serve as reference for updating element properties that are common in all configurations. Such properties can be, for example, joint stiffness or material properties. Using only a single stage of deployment would not provide sufficient information to identify all properties. Another example is composite material identification using tests on plates and coupons with different geometries. This will introduce more mode shape types and possibly also redundant test data for improved identification of material properties. 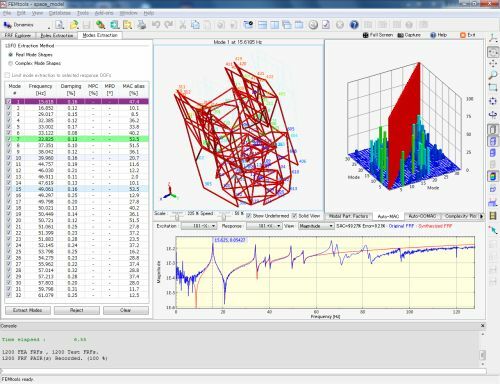 FEMtools Model Updating includes an MMU automation tool that collects the FE and test data for each configuration and automates the process of sensitivity analysis, sensitivity matrix assembly, parameter updating, and FE re-analysis. This makes MMU a straightforward and easy to use process. Validating and updating a finite element model in a bottom-up procedure is in general more rewarding than a top down approach. The bottom-up approach naturally follows the validation pyramid with coupon and component testing a the base, building up to sub-assemblies and finally to full assemblies at the top. At each level the complexity is increased and joints are added. For updating purposes, this means that the updating parameters for each model to be validated are limited to the uncertain parameters introduced at the level under study. Components that have been validated previously can be frozen as superelements and added to an assembly at a higher level. In a top-down approach, the selection of relevant updating parameters would be a serious challenge given the large number of potential parameters in an assembly. It is also more difficult to conduct validation experiments if the assembly is a large structure, and in a top-down approach these would be the only validation experiments. The bottom-up approach to model validation and updating is supported in a natural way by the dynamic substructuring methods that are available in FEMtools. Using substructuring, the different components that constitute an assembly are modeled, tested and updated separately. Updated components are frozen as Craig-Bampton superelements. Repeated tests at different phases of the assembly allow focusing on the modeling of joints. Component modes synthesis is used to obtain the responses of the assembly. A vibration monitoring system, combined with a structural health evaluation system, enhances safety by allowing better planning of inspections and maintenance work. Such a system may include an Operational Modal Analysis (OMA) tool to extract mode shape from acceleration, velocity, displacement or strain time histories in situations that the dynamic loads are unknown. This is typically the case for large structures like for example bridges, offshore platforms, or aircraft. If the modal extraction process is automated then the modal parameters (resonant frequency, mode shapes and modal damping) can be monitored 24/7 over long periods of time, ideally covering the entire operational lifetime of the structure. They can be used for applications like FE model updating and damage identification. If the deformation of the structure is also monitored, then modal parameters, in combination with an updated finite element mode, are also used for dynamic stress recovery at all locations of the structures as an alternative to strain gauges. These stress are in turn used for accumulated fatigue monitoring. ABAQUS can condense stiffness and mass matrices at external nodes and enriched by Craig-Bampton component modes synthesis. This is equivalent to the use of superelements in FEMtools and other finite element programs. 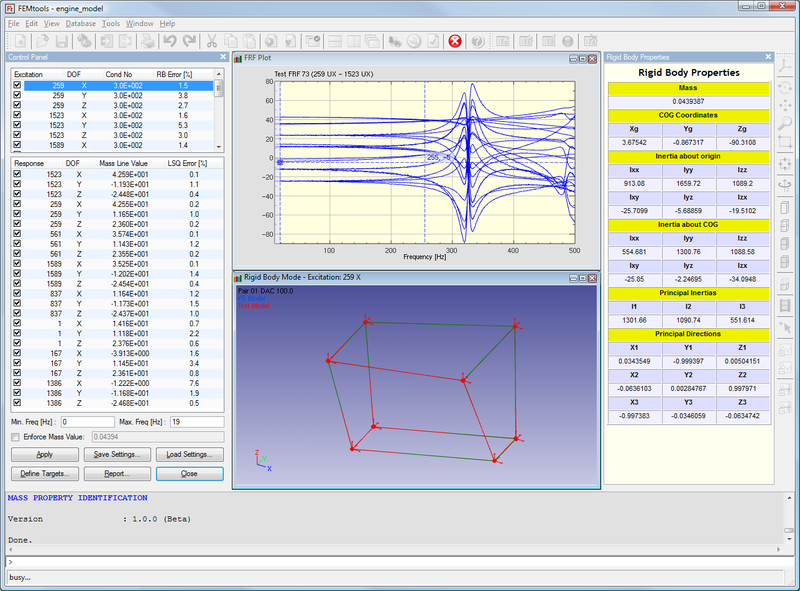 FEMtools 3.5.2 comes with a new interface to import superelement matrices condensed with ABAQUS. 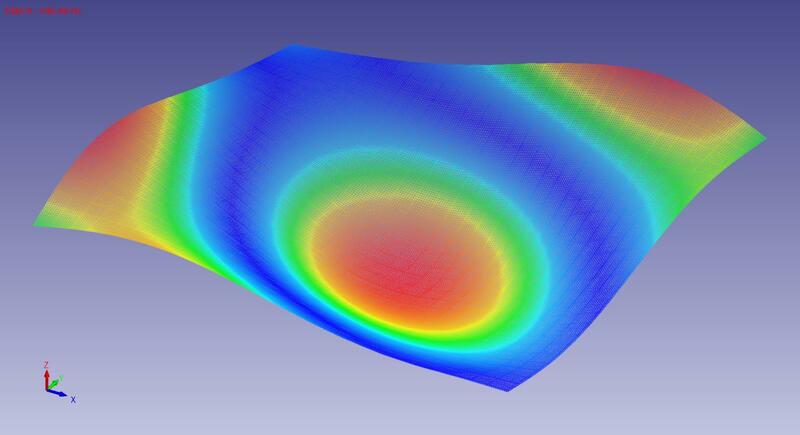 Once imported in FEMtools, the ABAQUS condensed matrices can be used as a standard superelement in every FEMtools analysis that supports superelements. This feature allows, for instance, the management in FEMtools of large assembled FE models that use ABAQUS specific features like tie-contact without loss of accuracy, mixing condensed parts to a residual FE mesh. Similar functionality exists for superelements imported from NASTRAN. The superelement reduction can be used to speed-up pretest analysis, dynamic analysis, correlation analysis on large assemblies and even model updating of the residual part of the FE model. Using a wireframe connection between the external nodes, FEMtools allows the visualization of mode shapes using a ?test model? look and feel. The concept of geometry updating was explored in a recent study of the cast iron lantern housing of a gear box. The resonant frequencies and mode shapes of the test structure were measured using impact testing. Next, a set of digital pictures were taken from a number of different angles. By means of photogrammetry, these pictures were converted into a surface model that represented the actual geometry of the lantern housing. This surface model was then compared with an FE-model derived from a CAD-model of the lantern housing. In this way, the regions where there was a substantial difference between the actual geometry and CAD-model could be identified. Finally, the geometry of the FE-model was corrected based on the measured geometry using a mesh morphing technique. For the considered test case, the correction of the geometry provided a significant improvement of the quality of FEM-test correlation of the modal parameters. The project demonstrated that only a limited number of geometry measurements are needed to update a CAD-based geometry using mesh morphing techniques. With geometry updating it is possible to eliminate most of the uncertainty on the geometry. As such, geometry updating eliminates, or at least reduces, the need for equivalent parameter changes to compensate the effects of geometrical inaccuracies. As the updating process provides parameter changes that are physically more relevant, the application range in which the updated FE-model can be used as a reliable predictive tool for design optimization can be increased. Improving the accuracy of the FE model to predict a larger number of mode shapes covering a wider frequency range, increases chances to detect damages or manufacturing issues by monitoring the modal parameters. Combined with automated testing and metrology, this opens up the perspective of a modal-based quality inspection tool. Finite element model updating is a well established method for validating and improving simulation models in structural dynamics. The traditional approach consists of correlating simulation data with the results of an experimental modal analysis (EMA). Natural frequencies and mode shapes extracted from frequency response functions are preferred as references since they are independent of the applied loads. However, the operational loads or boundary conditions can change the dynamic behavior of a structure, or make it impossible to perform an experimental modal analysis with measured or controllable dynamic loading. In such cases, only operational data can be used as reference data for model updating. Additionally, updating a model using operational data automatically guaranties the validity of the model under the considered operational conditions. Reprise Software, the developers of the RLM license manager that is used in FEMtools, has conducted a number of on-line tutorials designed to help licensed software end users get more value out of the Reprise License Manager (RLM). The recorded sessions can now be viewed from the Reprise Software website at http://www.reprisesoftware.com/support/end-users.php. For more information on tutorials, see the Reprise Software Blog. FEMtools users are encouraged to subscribe to this blog to receive regular news about the RLM license manager. Laser vibrometry or electronic holography can be used to obtain vibration modes which in turn can be correlated with finite element results. Each experimental mode shape will typically be presented as a dense cloud of scanning points with each point moving in the direction of the laser or camera. Analyzing the correlation of these vibration modes with a finite element model poses some specific problems with respect to mapping the scanned surface onto FE model, identifying and extracting the corresponding translation degrees of freedom, averaging for measurement noise and computing numerical correlation criteria. DDS has recently developed a custom solution for postprocessing a set of data files containing measured vibration modes with an ANSYS finite element model of a turbine blade. Written in FEMtools Script, this solution automates the entire work flow and reporting of results. It can be integrated into the FEMtools menus or operated in batch mode for processing large quantities of data or as part of an integrated quality inspection system. Dynamic Design Solutions announces the upcoming release of FEMtools Rigid Body Properties Extractor, a new tool to obtain the mass (M), center of gravity (CoG) and mass moments of inertia (MoI) from the low-frequency portion of measured accelerances (FRFs). These properties are useful to serve as targets references in updating the finite element model of the tested structure, or to reduce components to lumped masses for model reduction in structural dynamics simulations or motion analysis. Obtaining the rigid body properties is done in 2 steps. First, the rigid body responses (called "mass lines") must be extracted from the FRFs. The mass line corresponds to the value of the flat part of the response located between the low-frequency suspension modes and the elastic modes. These values are obtained by using a least squares fit of a low order polynomial (e.g. quadratic approximation). Once the mass line values are known, then the rigid body mass properties are obtained in the second step by solving a set of algebraic equations. Experimental data are imported from a Universal File (UF) or other. The FRFs must satisfy some requirements with respect to the measurement configuration (acceleration/force obtained from a freely suspended structure), and the number and positioning of excitation and response locations. If these conditions can be satisfied, then the proposed method presents a low-cost and fast alternative to traditional pendulum techniques. FEMtools Rigid Body Properties Extractor Control Panel (click to enlarge). The FEMtools Rigid Body Properties Extractor comes as an add-on to any FEMtools configuration. It is an interactive tool that allows the user to display the FRFs, define a frequency band between the suspension modes and elastic modes, and analyze the mass line values. An inertia box visualizes the equivalent mass volume with animation of rigid body modes. 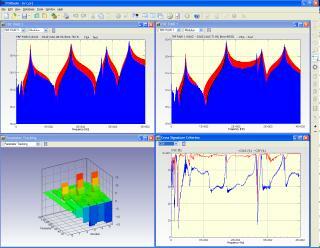 The rigid body properties (M, CoG and MoI) are displayed in real-time using tabular format with several error estimates. They can be exported for use in other programs or be used as updating targets in FEMtools Model Updating. Such identification routine was implemented using FEMtools Script for the process identification part, FEMtools Optimization for the optimizer routines, and used MSC.Marc to compute the reaction force curves. The pretest analysis tools in FEMtools Correlation are primarily used to find the optimal number and location of transducers for modal testing. One of the methods that are available is the Iterative Guyan Reduction (IGR) method, which is an elimination method to optimize sensors using the modal cross-orthogonality as selection criterion. The method can as well be used for selecting master DOF for Guyan reduction. In an FEA-only context, there are no constraints on the number of master DOFs and their accessibility because they will not serve as test locations. Furthermore, master DOF can include rotational DOF. Using the IGR tool in FEMtools is a fast and efficient way to select master DOFs for structural components that will be reduced using Guyan reduction.